From the beginning of KPFA, Pacifica radio was always a creature of the social cohesion policies of left-liberals, especially appealing to counter-culture anarchists. It was never a radical (Marxist-Leninist) radio station as is widely believed. Sadly, it has now deteriorated to a network that is not only heavily in debt, but a home to conspiracy theorists. I told the story of my own experience there on this website, but it seems timely still. 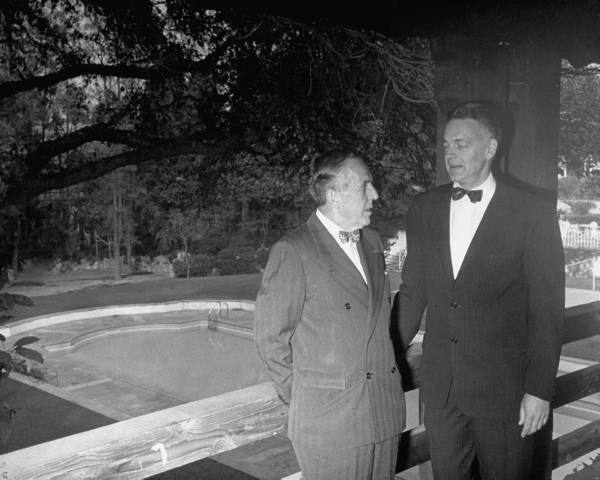 Pictured are Paul G. Hoffman and his close friend and ally Robert M. Hutchins. Their role in the adoption of Keynesian economics in American big business along with discreet mind-management is told elsewhere on this website. (For starters, see https://clarespark.com/2010/06/19/committee-for-economic-development-and-its-sociologists/ in tandem with https://clarespark.com/2011/01/02/the-watchbird-state/.) For my personal experience at Pacifica as both programmer and Progam Director, see the links below, which are both analytical and anecdotal. Because Pacifica was the precursor to NPR, “community radio”, and “alternative media” (including “indy media” and even the Sundance Film Festival) these blogs and my memoir are worth your attention. https://clarespark.com/2012/09/14/ron-paul-anarchist-in-chief/ (on overlap between left-wing and right-wing anarchism: Phillip Smyth author). HI, I found this post from my Pacifica Radio tag and thought I would check it out. It’s sad that the public media in the US is being driven into debt or, worse, quasicommercial status (“underwriting”). It seems as if free speech in the US is a failed ideal as is the Second And Third Amendment guarantees against the establishment of a standing army (Which since you have an interest in this period, you know isn’t blather). Did you read the various segments of my Pacifica memoir? It was not the failure of free speech that led to Pacifica’s downfall, but racial politics (multiculturalism) and one-sided sectarian politics that rejected the marketplace of ideas; i.e., Stalinism, Maoism, and progressivism dominate public radio, and all are toxic to intellectual and cultural freedom. As for your constitutional argument that there should be no standing army, I am befuddled as to your motives and politics.